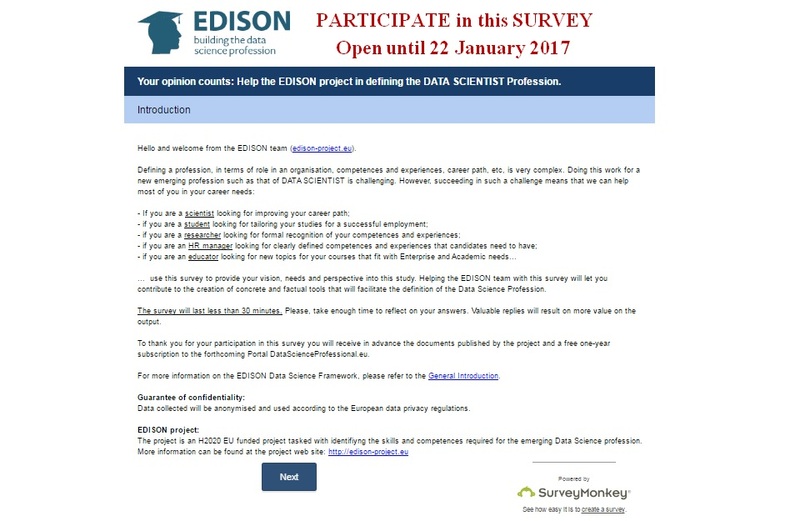 The EDISON - Building The Data Science Profession project launched a recent questionnaire with the aim to consolidate the understanding of the Data Science professions. The survey will take some 25 minutes of your time to be completed and will be kept open until 22 January 2017. The emergence of Data Science technologies is having an impact on nearly every aspect of how research is conducted, how scientists think, and how research data are used and shared. # Why does Data Science matter? On the other hand, the lack of digital skills, and data literacy in particular, is an evident issue in European Union (EU) markets. European Commission is proactively engaging with entrepreneurs, decision-makers, and educators to act now to secure the EU leadership in the digital economy. One of these efforts is represented by a 2-year (started in September 2015) EU H2020 project – EDISON. The purpose of the research is to accelerate the process of establishing the profession of Data Scientist by identifying skills and competences required for the emerging Data Science professions. To this end, your point of view is crucial for this analysis on how the professional practice of data scientists may evolve. The survey will take less than 30 minutes of your time to be completed and will be kept open until 22 January 2017. EDISON team appreciates your effort and believe that this is a unique opportunity to provide your own perspective and contribution to a wider EU effort. # To participate, click on this link. In case you would like more background material – please click HERE. The survey is confidential; neither your name nor your company's name will be associated with your answers. Please be assured that any responses you provide will be used only in combination with those of other survey responses. Results of the survey will be included in the project deliverables that will be freely available through the project web site library. They will also be presented at the Second Champions conference on 15-16 March 2017 in Madrid. If you have any questions about this survey, you may contact Andrea Manieri <andrea.manieri@eng.it>. Thank you for your assistance in this important endeavour!